Changes in forest composition as a result of forest management, natural disturbances, and climate change may affect the accumulation of soil organic carbon (SOC). We examined the influence of common boreal tree species (trembling aspen, black spruce, and jack pine), either in pure stands or in conifer-broadleaf mixtures, on the amount, distribution, and quality of SOC in two regions of the Canadian boreal biome. Long-term laboratory incubations were used to assess SOC quality by quantifying proportions of fast carbon (C) (that is, proportion of total C released during the first 100 days of incubation) and active C (that is, modeled proportion of total C that can be potentially released). Total amounts of SOC did not differ between stand types, but the effects of stand type on SOC stocks and quality differed with soil depth. Among stand types, aspen stands had the greatest relative proportion of total SOC in deeper mineral layers and the lowest amount of active C in the organic layer. For these reasons, the SOC stock that developed under aspen was more stable than in the other stand types. 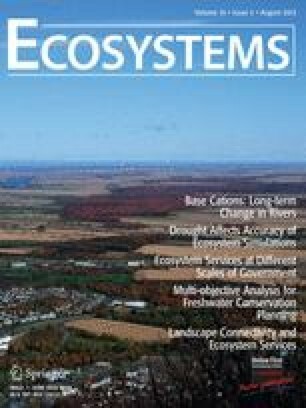 Although black spruce stands allowed a greater accumulation of SOC in surface layers, these stocks, however, might become more vulnerable to extra losses if environmental conditions are to become more favorable to decomposition in the future. Our work highlights that boreal forest composition influences the stability of SOC stocks and how climate change could alter this large C pool. All authors contributed to the study design. JL performed research and analyzed data, and all authors wrote the paper. The online version of this article (doi: 10.1007/s10021-013-9658-z) contains supplementary material, which is available to authorized users. This study was funded through the Natural Sciences and Engineering Research Council of Canada (SPG281886) and the Fonds Québécois de la Recherche sur la Nature et les Technologies. We acknowledge the support from Produits Forestiers Résolu, Tembec, BIOCAP Canada, the Ontario Ministry of Natural Resources, and the Canadian Forest Service. We are grateful to Luc St-Antoine, Éric Girard, Jessie Parent, Stephen Hart, and Alain Courcelles for their valuable assistance in the field and in the laboratory. We thank Michèle Bernier-Cardou for her statistical assistance and Yan Boulanger for comments on an earlier version of the manuscript. Canada’s NFI. 2010. Canada’s National Forest Inventory: monitoring the sustainability of Canada’s Forests. Ottawa, ON: Canadian Council of Forest Ministers. http://nfi.nfis.org. Environment Canada. 2010. Canadian climate normals or averages 1971–2000. Fredericton, NB: Environment Canada. http://www.climate.weatheroffice.ec.gc.ca/climate_normals/index_e.html.